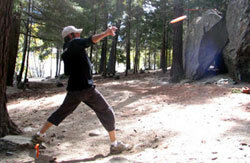 The 3rd New Zealand Disc Golf Tour Event for 2006 is one that many players look forward to for months. The Helicopter Line Queenstown Classic and Dart River Safaris Paradise Disc Golf Experience is something special for the disc golfer, and this year was no exception. TD James Smithells is now back living in Queenstown and as usual had a warm welcome for all the travellers, from as far a field as the Netherlands [Yes Flatlander Arthur Bosschaart was back for the umpteenth year] and Liam Young from the UK had timed his visit to our shores to fit in with the Southern Alps event. There was the usual rent-a-crowd from Auckland and Christchurch and the Hardy boys from Dunedin and even a few of the locals we’re keen to test their skills with their new plastic. Saturday was a misty hazy day with a spot of wind on the hilltops, making Paradise a testing day, 10 pairs contested the doubles in the morning and 19 players stayed for the afternoon round of singles (round 1 of the 3 that make up the tour event). At the end of the day Sammy Neilson from Christchurch took out the Open Paradise Plate with an impressive round of 46, with Ken Jarvis on 49. The Masters went to the man who really should be playing Grand Masters but wanted to let James have a crack at the trophy, Bob Gentil in his first tourney back from injury shot a 52 ahead of Neil Hardy on 54, and the Grand Masters went to Nigel Barnwell with a 56. Yet another special day of Disc Golf, friends and fraternity at ‘Paradise’ in the midst of the Southern Alps lake district. 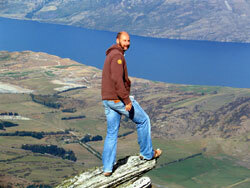 This Is Where We Play - At the northern tip of Lake Wakatipu is Paradise Valley. 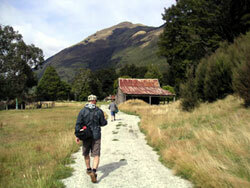 The course is not far past Glenorchy. The spectacular views compliment the stunning golf we see from international greats such as Ken Jarvis, Arthur Bosschaart and Juan Unda. The Bush Sauna - Used to warm you up in the snow, this area became the green of the tough 10th hole. A spot where groups often congregated. Hole 15 ARCH RIVAL The dog, the rabbit and the quadruple bogey !! ?# - An ominous sign greets golfers as they crest the hill to look down upon the 16th hole. Variable Terrain - An apt description of the contours of the course in Paradise Valley. Here we look up at a group at the tee alongside the flag. FOUR! - No Sleep Pete shows his unique 'Jackie Chan' whip action from up high alongside the traditional Paradise flag that is set up every year for this event. Paradise Disc - A stunning setting, surrounded on three sides by 400 metre plus rock faces..
Breathtaking - No, we're not talking about good lookin' Jono Foley and his doubles partner and son, Sam. Everyone takes a break at the 13th tee for a picture and a look at the view. The Marvelous Mexican - Would this be the first event this year that Juan Unda actually completes? He was certainly looking ready to perform halfway through the prelim doubles round - here on 15. Straight Arm Sam - Artful Dunedinite Sam Foley is getting a reputation for well controlled drives, complete with stylish follow-through. Here his disc is looking good relative to the target which is zoomed top right. James Won't Like This Shot - Here we have evidence that those Aucklanders who were quite late to the event even stopped along the way for a photo! "Get Up There" - Jono Foley grits the teeth with determination that his disc will fight the wind in his face as he tries to climb up to the target. Jono was one of the international visitors, well kinda. A kiwi who has drifted across the Tasman, Jono makes sure he returns for such important events as MTB rides with his Freaky Styley mates and disc golf tournaments with his Freaky Styley mates. For this event, he got to do both, riding extreme downhill mounatinbike via the Queenstown Gondola and, of course, disc golf via this incredible event. Dual Angle - Not that Jono Foley will be pleased to see this again! Early disappointment all over the face as he quickly realises he has mis-calculated the approach shot to within the V of the tree. Sunday saw 34 players and numerous hangers on attending the players meeting in the Queenstown Gardens, ahead of the ‘11th Annual Helicopter Line Queenstown Classic’. Sadly the locals Ultrastar division was a little lacking, but that is probably due to the fact the premium Innova Golf Discs are now available at Escape in Shotover Street and of course by surfing the discs for sale section of this web site. I guess it was always going to happen once local players discovered the joys of real DG plastic. Briefing - Great to see a big turnout with players from all over the planet. That aside the day was beautiful for Disc Golf. Round 1 saw the world ranked Ken Jarvis come in with a new course record of 39, the ‘GM’ was 6 shots back on 45, and UK golfer Liam Young shot a 47. Auckland Golfer Chris Kingsnorth made the top group for the afternoon with an opening round of 48. When the second round cards came in Ken had shot a 45, to give him a tournament course record of 84, and a well deserved win in the 2006 Queenstown Classic. Back On His Feet - It was great to see the Grand Master himself back on the course. Coming back from some hefty injury setbacks, Bob Gentil was once again up with the top showing his usual uncanny grasp of frisbee control. How Pretty - Well, you would know we are not talking about Jim Gabb's putting style. Must be the pretty flower beds that frequent the course through Queenstown Gardens. Mind you, Jim was finally back to a bit of form - form that he lost sometime last century. This weekend he scored some respectable male-like rounds in Queenstown. 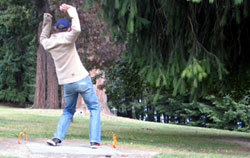 Keeping The Foot Down - The out-there mandatory on hole 9 can be a tough one to enforce. Video evidence has shown that some players do lift the back foot before the disc leaves the hand. Its a hard one to judge live tho' and many golfers are, of course, trying to get that extra bit of power so as to get pin high. 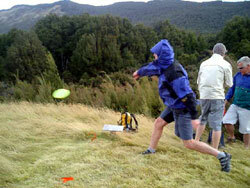 One For Bruce - We think this is a Christchurch basketballer/disc golfer called Bruce. And we captured him appropriately on the hole named after one of the driving forces behind this magic course, the late Bruce Grant. I Can See Right Through You - Deligthful discer Debbie has shown a natural knack for forehand frisbee finese. Now try saying that quickly 10 times over. Rock King - Another Cruisey Caldwell pose as Regan rocks on from the unique 3rd teebox that is a 42 tonne rock! This Is Frisbee Golf - Alongside the sign at the first tee, No Sleep Pete drives after doing some 'Smithells Marketing' of disc golf to some park users. Twisting By The Lake - The drive on the hardest hole - Windy Way - was crucial. 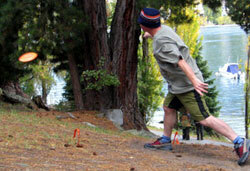 Here beanie wearing jock Jim Gabb lets rip in his new 'groovy' disc golf boots. This One's For Bruce - Tournament Director James Smithells knows this course very well and performed well with 2 rounds of 52 to place him 8th overall and second in his class. And all this with the pressure of tournament organisation and multiple personalities. 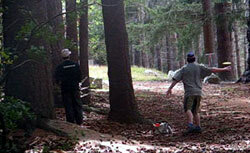 Crucial Approach - Amoungst the pines, players must really think about their approach to the basket on hole 15. An early basket design, even 5m putts are dicey on this one! And then there are the rocks surrounding the basket, which are waiting to bounce your disc into a tragic roller. Here Jim Gabb shows conviction to curve into the zone. Cameraman or Stuntman?! - The disc is coming straight to the cameraman Len Skap. And in typical Gabbitas-like coolness, Len stays until the shot is captured. Awesome.. 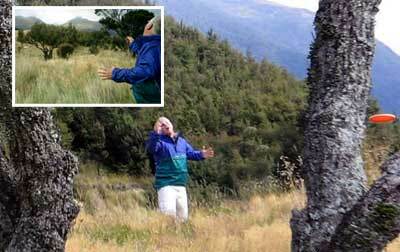 Salute To Bruce - Regan Caldwell lets fly with the foot firmly set onto the mandatory rock. 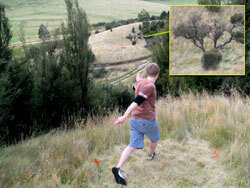 The Queenstown Flick - One of the fine local disc golf ambassadors, Regan Caldwell floated around the course in his typical cruisey manner, often heard to comment 'On any other day', a reference to the extra toughness of the trees being marked with tape. And With A Flick Of The Wrist - Wonderful Juanita Unda calculates angles and projectories so as to curve the risky roller around the large mandatory on hole 5. Local Knowledge - Visitors to this course soon learnt from the locals that aiming low was the go - some of these chains seemed determined to spit you out. Local golfer Regan Caldwell makes sure of it here, playing an 'Official Round'. Sammie Ain't No Jammie! 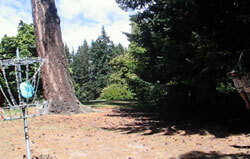 - Originally from England, disc golfer Sam Neilson played quite magnificently at Paradise on the Saturday. Come Sunday, he experienced quite a lot of bad luck to stay out of the top group. 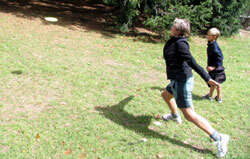 My Sheree Amour - The feminine side of the Gentil Disc Golf Empire, Sheree shows that, despite having very little golf under her belt for the last few years, like riding a bike she slots straight back into it and played well enough to take the Womens Division. 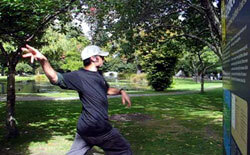 The Trapess Boogie - Another great tee pose on the 7th as leftie Queenstown cricketer Simon Trapess tried to 'twist' his disc - showing us he actually realises he will be lucky to make the mandatory pine tree split. 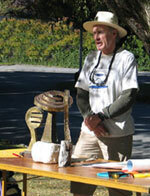 "I Must Tell You About The Time..." - At the prize table, Tournament Director James Smithells prepared to hand over the many great prizes that he and his team spent many hours working to secure. The local Queenstown businesses are very supportive of the event, much to the joy and appreciation of all golfers involved. "Don't Do It!" - Returning to New Zealand for at least the 8th time, friendly Dutch giant Arthur Booschaart once again had a ball. "And de ride in de chopper wit Gabb was awesome!" Here Arthur is on top of the world thanks to Helicopter Line and their wonderful prizes as part of their sponsorship of the event. Nice Crouching Putt - One of those shots that defines a good recovery - James recovers with a superb putt, peering through the leaves. Making Sure Of It - Like most players, Pee Wee golfer Toby Gentil wanted to make sure of the short putt on the tricky 5th "Windy Way", as a miss and bounce off usually means a tragic roll down to the lake! Ponderosa??! 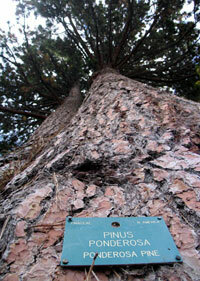 - A read of this label on one of the mighty trees reminded one of the infamous 'Ponderosa' disc golf course at NZ Champ Simon Feasey's Kaukopakopa site in the North Island. Whilst we were enjoying this tournament, Super Simon was on his way to win gold for NZ in Taiwan. Pondside Magic - Regan Caldwell in action on the dogleg 18th. Pondside Meeting - Prizegiving - and the exciting Big Prize Throw Off - was held in the sun by the pond.